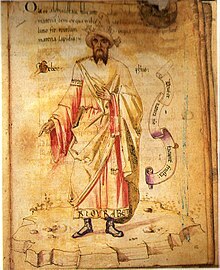 Abu Musa Jabir ibn Hayyan (Arabic: جابر بن حيان) (c. 721–c. 815), known also by his Latinised name Geber, was a Persian prominent chemist, alchemist, pharmacist, philosopher, astronomer/astrologer, physician and physicist. He has also been widely referred to as the "father of chemistry". Ibn Hayyan is widely credited with the introduction of the experimental method into alchemy, and with the invention of numerous important processes still used in modern chemistry today, such as the syntheses of hydrochloric and nitric acids, distillation, and crystallisation. His original works are highly esoteric and probably coded, though nobody today knows what the code is. On the surface, his alchemical career revolved around an elaborate chemical numerology based on consonants in the Arabic names of substances and the concept of takwin, the artificial creation of life in the alchemical laboratory. ↑ "Jābir ibn Ḥayyān, Abū Mūsā." Encyclopædiaffhh Britannica. Ultimate Reference Suite. ↑ William Royall Newman, Gehennical Fire: The Lives of George Starkey, an American Alchemist in the Scientific Revolution, Harvard University Press, 1994. pg 94: "According to traditional bio-bibliography of Muslims, Jabir ibn Hayyan was a Persian alchemist who lived at some time in the eight century and wrote a wealth of books on virtually every aspect of natural philosophy"
↑ William R. Newman, The Occult and Manifest Among the Alchemist, in F. J. Ragep, Sally P Ragep, Steven John Livesey, "Tradition, Transmission, Transformation: Proceedings of Two Conferences on pre-Modern science held at University of Oklahoma", Brill,1996/1997, pg 178:"This language of extracting the hidden nature formed an important lemma for the extensive corpus associated with the Persian alchemist Jabir ibn Hayyan"
↑ Tamara M. Green, "The City of the Moon God: Religious Traditions of Harran (Religions in the Graeco-Roman World) ", Brill, 1992. pg 177: "His most famous student was the Persian Jabir ibn Hayyan (b. circa 721 C.E. ), under whose name the vast corpus of alchemical writing circulated in the medieval period in both the east and west, although many of the works attributed to Jabir have been demonstrated to be likely product of later Ismaili' tradition." ↑ William R. Newman, Promethean Ambitions: Alchemy and the Quest to Perfect Nature, University of Chicago Press, 2004. pg 181: "The corpus ascribed to the eight-century Persian sage Jabir ibn Hayyan.."
↑ Wilbur Applebaum, The Scientific revolution and the foundation of modern science, Greenwood Press, 1995. pg 44: "The chief source of Arabic alchemy was associated with the name, in its Latinized form, of Geber, an eighth-century Persian. " ↑ Neil Kamil, Fortress of the Soul: Violence, Metaphysics, and Material Life in the Huguenots New World, 1517-1751 (Early America: History, Context, Culture), JHU Press, 2005. pg 182: "The ninth-century Persian alchemist Jabir ibn Hay- yan, also known as Geber, is accurately called pseudo-Geber since most of the works published under this name in the West were forgeries"
This page was last changed on 1 December 2018, at 13:36.